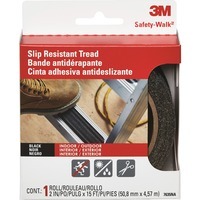 Use this safety tread tape on ladders and walks to help prevent slips and falls. Durable tape helps provide safe footing in indoor wet areas. Comfortable for bare feet, the strip resists mold and mildew. Strong adhesive resists peeling and wrinkling. Black tread is precut for easy application to ladders.